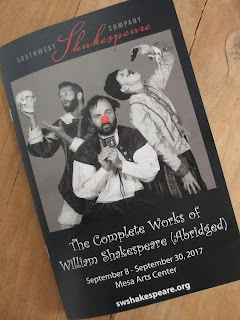 Fall is coming upon us, and you know what that means: Southwest Shakespeare and the rest are starting in on their new seasons. Friday night was the opening of The Complete Works of William Shakespeare (Abridged) directed by Debra K. Stevens. The evening was particularly special as a sign that the company was still able to stay on schedule after the huge setback that was the fire in their warehouse over the summer. You can read more about the fire here and make a donation either there on their website or on their GoFundMe page, if you feel so led to help out the arts. Whilst watching The Complete Works, I felt like I had the perfect perspective to come in to this show. I don't necessarily like Shakespeare. At one time, I disliked Shakespeare. Then I eventually conceded that I liked a lot of things about Hamlet. Then I realized that I like the tragedies more than the comedies. Then I admitted that there is plenty of literary content to analyze in the plays. And then finally I found that it's the performance that also gives meaning to the text, and a performance can be great to watch even if the text isn't necessarily your favorite to read. This play is marketed as being for everyone: those who do like Shakespeare, those who don't, and those who hold neither opinion. It's absolutely true, too. It's a comedy and a parody, performed by three actors (in this case, Breona Conrad, Louis Farber, and Alexis Baigue). They condense the plays down into quickly presentable forms, and they give some "background information" on Shakespeare and his plays. This leads to some discussion here and there about all of the various topics (artistic, literary, historical, and social) that come along with the plays; while it's all comedic, there is true content in there, as well. That's the heart of good parody, after all: good parody gets to the heart of its subject, leaving that part intact while adding fluffy or silly extensions here and there like feathers stuck into a central sphere. This play isn't just about the actors trying to quickly run through the dialogue of thirty-seven plays at lighting speed. It isn't that kind of show. Instead, they spend a good portion of time on Romeo and Juliet because it's one of the most widely read and viewed. They cover Titus Andronicus and Macbeth a little more quickly--I don't know about everyone else, but I'm familiar with both of those plays. They comedies all get lumped together into one wacky composition, and Hamlet delightfully gets the entire second act because it's also one of Shakespeare's biggest plays. Parody or not, I found myself wishing that Shakespeare were performed like this more often. I'm not referring to the rap song or the tap dancing bit or the lightsabers. While those worked great for this play, what I want to see more of is this kind of delivery. These three actors all owned the stage, the scenes, and the dialogue. Part of their parody work involved real Shakespeare quotes, and they knew how to deliver the lines like words spoken by characters (as opposed to those performances where you're not even sure if the actors know what the words mean or if they were too busy trying to memorize difficult dialogue to even be able to interpret it). There was life in this performance. Sure, they purposefully overdid the enthusiasm a bit, but I don't think that's entirely un-Shakespeare of an approach. I think productions in general could use a little more of that style. While I'm on the subject of the actors, let me also mention how quick, on point, and versatile these three actors were. Like with Wittenberg back in April, it was a small group where every person played an important role and played it well. Wittenberg used comedy to make the audience think, but The Complete Works uses comedy as the result after thinking. We've all formed opinions on Shakespeare; the play gives us a time to sit back and smile and laugh over it all. From half smiles all the way to uncontrollable laughter. This was a tiny theatre, one of the spots in the Mesa Arts Center that I had never been in before (the smallest one they have there, I believe). Wittenberg had a small theatre at Taliesin West, as well--but that was different seating. This seating made you feel more like you were hanging out with the rest of the audience and with the actors. There was more of a physical connection among everyone, which of course worked well given that this play does involve a bit of audience involvement. Maybe all of this is part of the reason why the show built momentum as it moved along: the actors weren't just performing a script; they were feeding off of the audience's enthusiasm (this was such an enthusiastic audience, too, I might add). Sit in the front rows if you want to; don't if you don't. Involvement aside, I prefer the back rows because they're tiered and I'm short, so I get a better view from tiered seats. It's open seating, so if you want to be able to choose the place that suits you best, arrive early. The Complete Works of William Shakespeare (Abridged) is running through the end of the month; click here to see all the performance dates on Southwest Shakespeare's website. Go see it for a compilation of laughs; you'll just walk out happy, still glowing from that delightful treatment of Hamlet at the end.